Condominium boards in Ottawa are assessing their rules as the country moves towards legalizing recreational marijuana. One condo board in the city's east end just passed a law allowing owners to smoke pot in their units but they have to prove they have a medical need for it. The air is getting foggier every day for renters, landlords and condo owners as we work our way through the ever-changing marijuana landscape. Lawyers say now is the time to put some rules in place before pot becomes legal. Sue Kerr lives in the condo building on Bathgate Drive and welcomes the move to restrict smoking there..
Not only look at it but vote on it. The Carleton Condominium Association put into effect a list of rules December 15th that would grandfather those condo owners who currently smoke cigarettes but restrict smoking to inside their units only, not on the balcony and not in a common area. And marijuana use will only be allowed if there's a medical need for it and would require written permission from the Board based on Human Rights reasons. Growing marijuana plants would require proof of a medical need as well. The Ottawa Council on Smoking or Health agrees and is calling for a province-wide ban on smoking or vaping in all multi-unit housing. Lawyer Rod Escayola says many condo corporations are trying to come up with rules to deal with marijuana use in their buildings. He advises them to work quickly on that. And it's not just condos. Landlords in Ontario want the right to ban marijuana smoking for tenants who are currently under lease. As it stands, landlords can ban pot smoking in new leases, but they can't change an existing lease, meaning current renters can smoke pot in their units until their lease expires. Landlords want that to change. If that happens, marijuana users say renters will have very few places to smoke pot legally. Ian Davidson runs a company called Condominium Management Group that manages a third of the condos in Ottawa and says the air is getting cloudy with all the confusion over who will be able to smoke where. On the flip side of this are those looking for a place to smoke marijuana. And they argue those places are disappearing by the day to the point where even their own home may not be allowed. 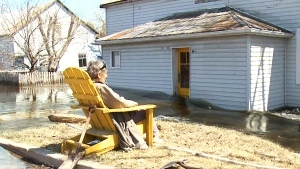 Dozens of homes are flooded in Lanark County in what residents are calling the worst flooding since April 1998.